Chopper Stabilized Op Amp prolongs battery life. Suitable for portable and battery-powered instruments, dual-channel Model ADA4051-2 features Auto-Correction Feedback Loop ripple-suppression technology to provide low offset voltage of 2-15 ÂµV. Rail-to-rail I/O helps provide dynamic range greater than 110 dB, while chopper architecture enables device to achieve PSRR and CMRR of 135 dB. 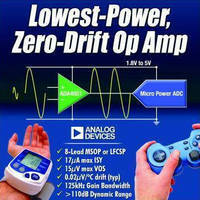 Operating from 1.8-5.5 V single power supply, zero-drift op amp draws 17 ÂµA and provides 125 kHz gain bandwidth. - Chopper stabilized ADA4051-2 op amp minimizes power use and prolongs battery life. Norwood, MA (07/30/2009) - Analog Devices, Inc. (ADI), a global leader in high-performance semiconductors for signal-processing applications and leading provider of amplifier technology, unveiled today a dual-channel, ultra-low-power, zero-drift operational amplifier that uses 30 percent less power than competing products. The compact ADA4051-2 is a chopper-stabilized op amp designed for portable and battery-powered instruments requiring high dc precision and measurement stability. These portable devices include gas analyzers, remote sensors, handheld medical devices and consumer gaming controllers. The ADA4051-2 features a new chopper architecture with ADI's patent pending ACFB (auto-correction feedback loop) ripple-suppression technology to provide low offset voltage of 2 microvolts (typ) and 15 microvolts (max). This architecture enables temperature drift suppression to 20 nanovolts per °C (typ) and eliminates 1/f noise. In addition, the ADA4051-2 provides rail-to-rail I/O, which helps provide high dynamic range (greater than 110-dB). The chopper architecture enables the device to achieve a high PSRR (power supply rejection ratio) of 135 db and CMRR (common mode rejection ratio) of 135 db (typ). The ADA4051-2 amplifier provides a 125-kHz gain-bandwidth product and draws only 17 microamps (max) which allows it to minimize power consumption and extend the operating time of battery-powered applications. The ADA4051-2 CMOS (complementary metal-oxide semiconductor) high-precision op amp operates from a 1.8-V to 5.5-V single power supply and features rail-to-rail input and output swings to maximize ADC (analog-to-digital converter) dynamic input range. The device is compatible with most ADCs currently available, including ADI's AD7942 14-bit, 250-kSPS PulSAR®, pseudo differential ADC and AD7788/89/90/91 ultra-low-power, Sigma Delta ADC family. For more information, visit www.analog.com/pr/ADA4051-2. For more product information on amplifiers, visit www.analog.com/en/amplifiers-and-comparators/products/index.html. PulSAR is a registered trademark of Analog Devices, Inc. All other trademarks are the property of their respective owners.